I’m a smart person, really I am. But over the past few years I’ve become so forgetful. I’m pretty sure that my brain issues were a gift of motherhood…or blogging…or trying to do both at once. I’ll regularly put something by my purse (a package to mail, a box of brownies to gift) so I won’t forget it. I’ll even put my keys on top so I’m sure I’ll remember to grab it on my way out. And then I get halfway where I’m going…and remember that that letter I was supposed to mail is still sitting on my entry table. Or I’ll tell myself that it’s been 5 days since Jordan got home from Sly Park (the 6th grade science trip) and I really should clean off the car windows. After all, the entire city and county now knows my daughter’s name is Jordan and she was out of town with the entire 6th grade because car pen ink doesn’t come off at the carwash. So I grab paper towels and windex and run out to my car…and then leave them on the seat and forget to actually wash the windows. The best one happened just tonight. I washed the whites today. Half the load has been sitting in my washing machine for 3 days waiting for the towels from upstairs, but I forget to bring them down after I’m done showering. So today I dumped the entire load, minus my towel, on the floor of my bathroom. I won’t forget, right? I have to literally walk over the towels to get out of the bathroom. Nope, forgot until 2:00. Then I forgot the towel I used…because I hung it back up on the rack when the dirty ones were under my feet. I swear, I feel like I’d forget Jordan if she wasn’t so loud. I somehow remember to feed her, myself (I never forget that, unfortunately), and I always remember to post (although sometimes I forget to write the words). WHAT IS WRONG WITH ME? I need cake. How about an Extreme Cookies ‘n Cream Oreo Cake? Yes? I can vouch for how good this cake is because I made it twice in a week. The first time, I was going to a party and just felt like making a cake. Normally I go with cookies or brownies for a party because they’re just easier, but I was totally craving cake. 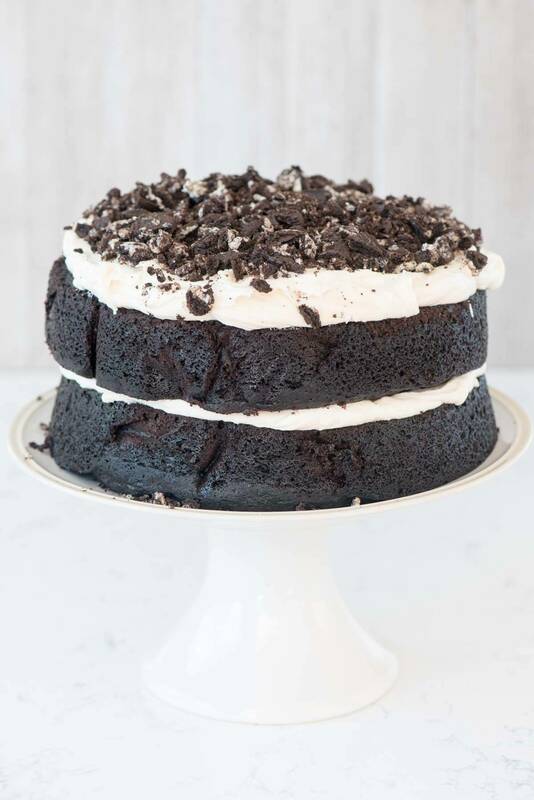 I decided to make a rich, deep, dark chocolate cake using my favorite recipe and then sort of turn it into a giant Oreo by making a frosting that tastes like an Oreo filling. I also crammed in a bunch of Oreos because why not, and I was taking it to a party so calories don’t count, right? Okay, so I made it that one time. At the party everyone raved about it. Coincidentally, I was making a birthday cake the following weekend for one of the little girls at the party and she loved the cake so much she wanted it for her birthday. Twice in a week – this cake recipe is proven to one, actually work, and two, to taste like the best thing ever. That means you probably need to go make it right now, I think. The cake is made super dark by using Hershey’s Special Dark Unsweetened Cocoa Powder. They sell it pretty much everywhere these days. You can use regular cocoa powder but it won’t be as Oreo-like. The cake itself is also EGG-FREE and DAIRY-FREE. The rise is created by a mixture of baking soda and vinegar. I also use coffee in the cake to bring out the chocolate flavor, but you can skip that and just increase the water if you don’t want to use coffee. I baked the cakes in two 8″ round cake pans. 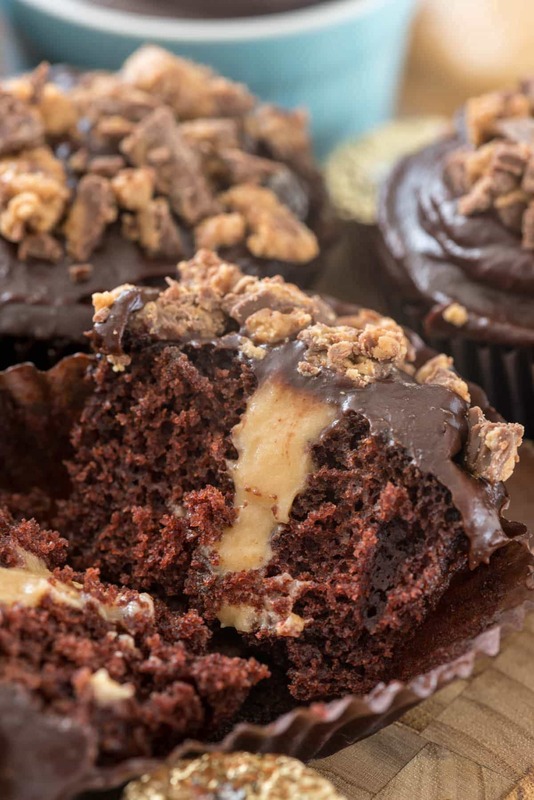 You can also bake this as a 9″ round or use a 9×13″ rectangular pan, or even cupcakes. The BEST part of this cake is the filling. The frosting really does taste like the center of an Oreo cookie – sweet and fluffy! It’s made by using a combination of butter, shortening, AND marshmallow fluff, which gives it that telltale Oreo filling taste. It’s a super easy frosting I like to eat with a spoon. I kept my cake “naked” because I’m lazy, but if you double the frosting you’ll have more than enough to frost the entire thing. (The birthday cake I made was done that way.) Or frost the top of a 9×13″ or cupcakes. 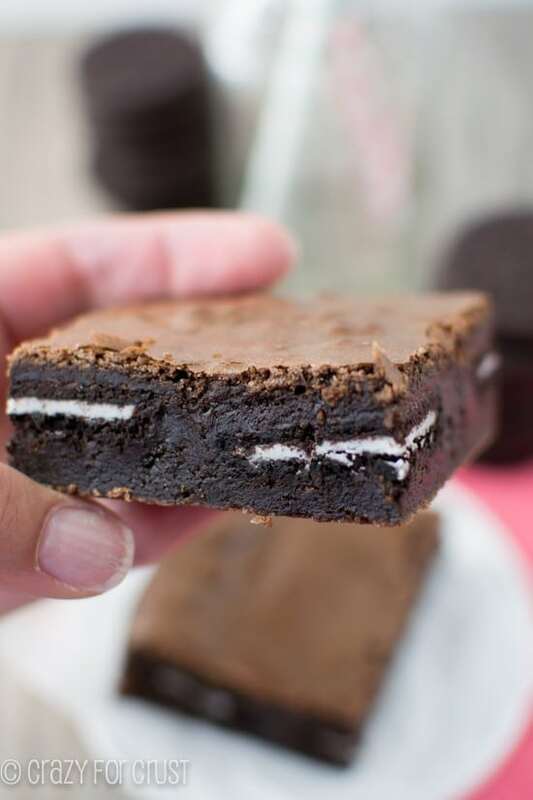 Just don’t forget to drown it in crushed Oreos! 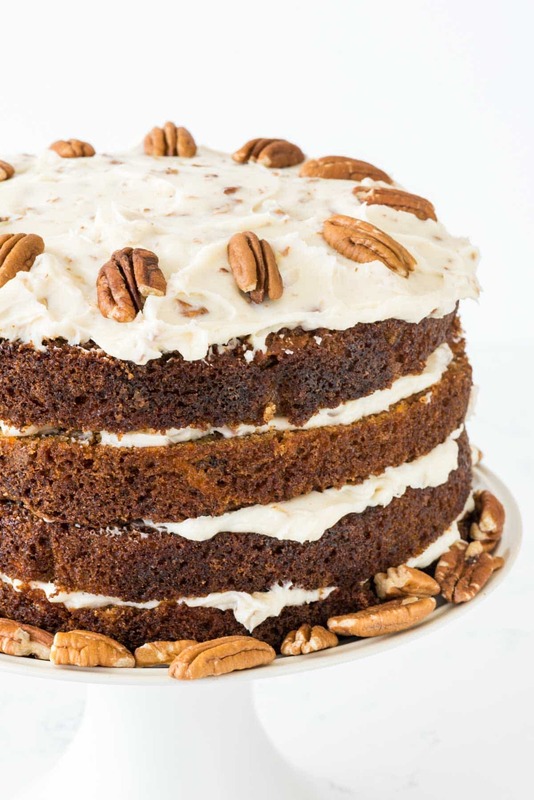 However you make this cake, it’s so good. Be sure to share it! 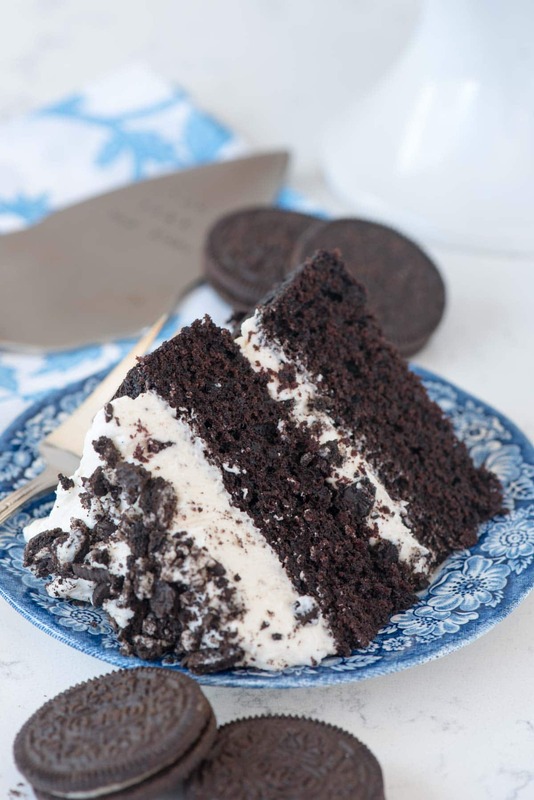 This Cookies 'n Cream Oreo Cake is FULL of chocolate and Oreo flavor. Dark Chocolate Cake filled with marshmallow buttercream and tons of Oreos! Whisk flour, sugar, cocoa, baking soda, and salt in a large bowl. Set aside. Whisk hot water, coffee, oil, vinegar, and extract in a large measuring cup or bowl. Slowly stir the wet ingredients into the dry, stirring or whisking until smooth. Pour batter evenly into pans. Bake for 34-38 minutes or until a toothpick comes out clean 3” from the side (the middle may still have a few crumbs stuck to the toothpick). These dome quite a bit (in an 8” pan). Let the cakes cool completely before removing from pans and frosting. Beat butter and shortening with a hand mixer in a large bowl until smooth. Mix in fluff until smooth. Slowly mix in the powdered sugar, the add the salt, vanilla, and 1 tablespoon of the cream. Mix on medium speed until smooth, adding more cream as needed for consistency. To assemble the (naked) cake: remove layers from the pans. Level them as needed using a serrated knife. Place one cake layer on a serving plate, top with half the frosting and smooth it to the edges. Top with half the crushed Oreos. Add the second layer and repeat with the frosting and crushed cookies. Serve room temperature but store loosely covered in the refrigerator. Note: to coat the cake completely with frosting, double the frosting recipe. Made this for my daughter the baker . It was a big hit! A snap to put together. omigosh I can only imagine how much worse my forgetfulness will get after I have kids! but it doesn’t really matter, everything is ok-because omg THIS CAKE. So chocolatey. so oreo-y. I love it! frosting to sub a stick of Earth Balance for the butter? We have some vegan family members! Love your blog & photos! If we made this and used cupcake liners do you know about how many this would make? tThis cake looks SO GOOD. I do have a concern though, the frosting is not vegan if you use regular marshmallow fluff or cream. I am not sure if there are any vegan versions. Marsmallow fluff is made mainly from eggwhites! None of these brownies are or claim to be vegan. My daughter made this cake for my son’s birthday and it was so yummy! Now she wants to make it for his grad party, but we need way more cake! So we want to make it in an 11×17 sheet pan and we’ll make two layers of that. So my question is, would you use one full recipe for each layer? And how long do you think to bake each layer? Do you know of anything I can substitute for the heavy whipping cream in the frosting to make it dairy free? Hi cake looks awesome! I’m making it for our Thanksgiving table but I have a question, I’ve never used Shortening in a frosting before how is the taste result? It doesn’t make the frosting taste “greasy” at all or is it basically for the texture factor ,like a thickener? And does this frosting taste like the filling in the actual cookie? That would be great Thanks. What can I use in place of the shortening?